President Moon Jae-in and Japanese Prime Minister Shinzo Abe held a summit Friday, but their third meeting served little more than to confirm differences between the two sides over thorny issues. According to Cheong Wa Dae spokesman Kim Eui-kyeom, the two leaders began with the issue of the 2015 “comfort women” agreement. “The comfort women agreement is an agreement between countries, and the international principle is that (an agreement between countries) is upheld even after an administration change,” Abe said. Under the 2015 agreement, reached during the previous Park Geun-hye administration, issues surrounding Japan’s sexual enslavement of Korean women during the 1930s and 1940s would be settled with Japan providing 1 billion yen ($9.1 million) to be used for compensating the surviving victims. With Moon’s election, the agreement came under scrutiny and an independent panel has since announced that the agreement was unfair, and that it was pushed through under pressure from Park’s presidential office. Moon repeated the South Korean government’s position that the matter could not be settled between two governments. “The victims and Koreans have not accepted the contents of the agreement. The comfort women issue can be resolved when the victims’ honor is restored, and their wounds are healed, it is not something that can be resolved in a government to government negotiation,” Moon said. At the meeting, Abe also raised concerns over North Korea’s intentions behind inter-Korean talks and its Olympic participation, warning that caution is need. 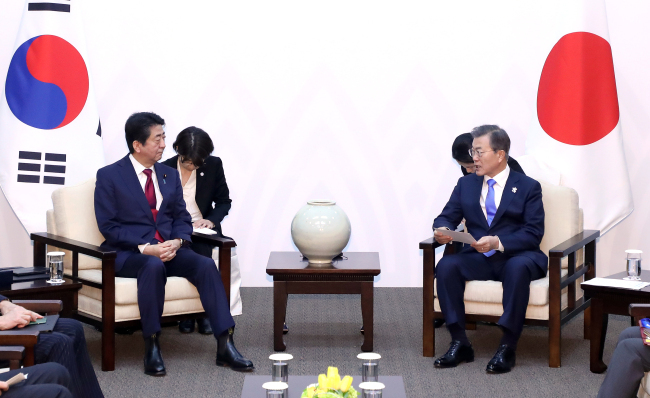 Moon played down the concerns raised by Abe, saying that inter-Korean talks do not affect international cooperation on the issue. “Improvements in inter-Korean relations and dialogue need to lead to denuclearization,” Moon said, requesting Japan’s support on the issue. Ahead of the meeting with Abe, Moon met with UN Secretary-General Antonio Guterres, and discussed a range of issues including North Korea. “I wait for the spring that will come after (the) PyeongChang (Olympics),” Moon said.